The Friends of Sleepy Hollow Cemetery are citizens who comprise a non-profit community organization with a mission to further enhance and promote the preservation, beautification, and appreciation of the public burial grounds in the Town of Concord. Those burial grounds include Sleepy Hollow Cemetery (1823), Old Hill Burying Ground (1670), and South Burying Place (1690). The Melvin Memorial, shown on the left,was sculpted by Daniel Chester French in memory of three brothers who died in the Civil War. 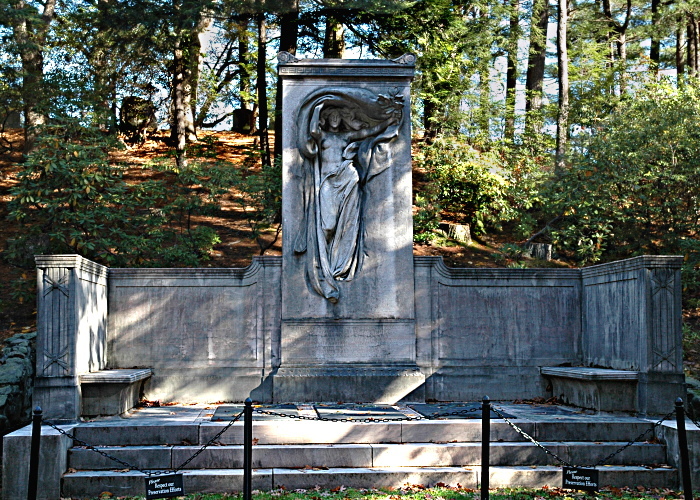 It was erected in Sleepy Hollow Cemetery in 1908. Designed by landscape designer Horace W.S. Cleveland, Sleepy Hollow is one of the earliest and best examples of a "rural" or "garden" cemetery. The rural cemetery movement was inspired by romantic ideas about death, and the new attitudes regarding the healing powers of nature and art. 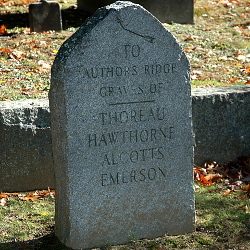 Sleepy Hollow Cemetery, the largest of the three cemeteries, is on the National Registry of Historic Places and extends for two-fifths of a mile on the north side of Bedford Street. Of its estimated 10,000 gravesites, many are of local, national and international significance. Composed of 119 acres, it is laid out in several phases, including the New Burying Ground (1823) and Sleepy Hollow (1855). Yankee Magazine recently highlighted Sleepy Hollow Cemetery in an article entitled Where Concord's Legends Lie.